What just happened? In their hunt for Planet Nine, a proposed planet that may lie beyond Pluto, astronomers at the Carnegie Institution for Science discovered 12 moons orbiting Jupiter. The find pushes Jupiter’s total moon count to 79, the most of any planet in our solar system. Scott S. Sheppard, who led the team, said Jupiter just happened to be in the sky near the search fields where they were looking for extremely distant solar system objects so they were serendipitously able to look for new moons around Jupiter at the same time. The discovery actually took place in the spring of 2017 but as Gareth Williams at the International Astronomical Union’s Minor Planet Center points out, it takes several observations to confirm an object actually orbits Jupiter. That meant the entire process took a full year. 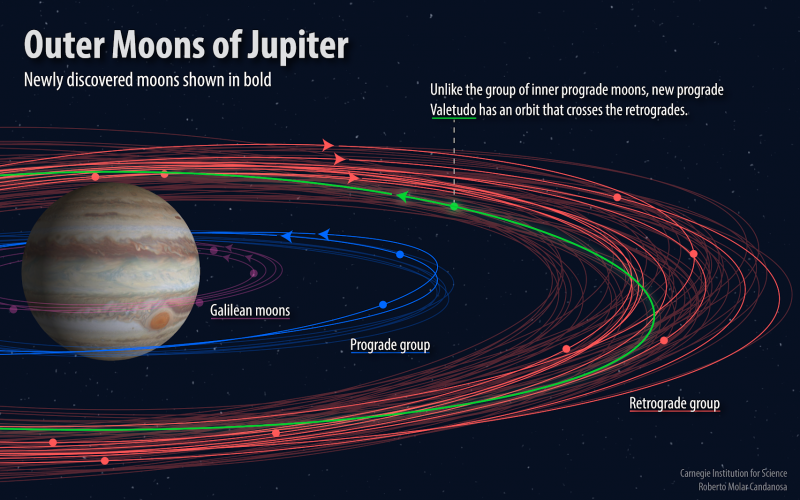 Nine of the new moons have retrograde orbits meaning they orbit in the opposite direction of Jupiter’s spin. They are thought to be the remnants of larger parent bodies that broke apart as a result of a collision with other bodies like asteroids, comets or other moons. Two of the new moons are part of an inner group of moons closer to Jupiter that orbit in prograde, or the same direction as the planet’s rotation. Like the others, they, too, are thought to be fragments of a larger moon that slammed into something else. The final discovery is classified as an “oddball” as it has an orbit unlike any other Jovian moon. It’s small – less than one kilometer in diameter – with a prograde orbit that crosses the outer retrograde moons. Because it’s moving in the opposite direction of the other moons, a head-on collision is much more likely. Such a collision would quickly break apart and grind the object down to dust, Sheppard said.